This is part of the ongoing ‘step-by-step‘ series which aims to guide users through online research tools and teaching aids. For Monday, stay tuned to a discussion about Twitter in the classroom. In this post, I’ll explain to students how to install Zotero on their home computers. As a teaching assistant, I’ve found this to be the most useful technological skill that I’ve taught undergraduates – many have confirmed this by noting how they now use it. The explicit inspiration for this comes from William Turkel’s ‘Going Digital in Two Hours,‘ a fantastic workshop that he ran for York University’s Graduate Programme in History last year. Kudos to him! 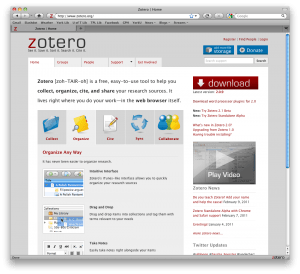 Why Zotero? In short, it will properly format footnotes/citations (critical if you’re taking courses amongst several disciplines) and keep a research database in the ‘cloud’ (i.e. you can log in on any computer and it’s all there). For graduate students and faculty working on large documents, it can also streamline referencing and make sure that you have perfect footnotes. My philosophy here is to assume that students are starting from ground zero: don’t assume they use Firefox, don’t assume that they use MS Word – you need to sell them on every aspect if they’re going to find time in their often busy lives. STEP ONE: Download and Install Firefox Why Firefox? Firefox is both free and open source (which means that anybody can use or alter the program’s code). You will probably find it quicker than Internet Explorer. Most importantly, however, you can download extensions. These improve your browser, and can make it a specialized research tool and bibliography manager. You could spend literally hundreds on these tools commercially, but here you can get them for free. 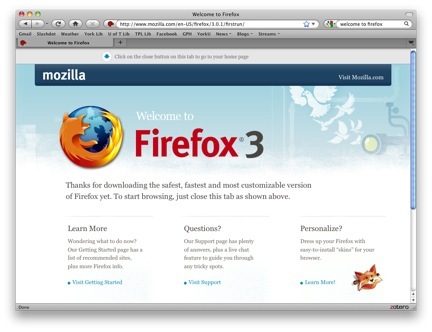 BROWSE here and click on the ‘Download Firefox’ button. It will automatically detect your operating system. It should be under 20MB. STEP TWO: Install Zotero and Integrate it with your Word Processor In my opinion, this is the coolest thing you will find in Firefox. I wish I had known about this earlier. Again, it will do your footnotes for you, properly, with short-forms and ibid., and automatically reformat them if you add footnotes in between. BROWSE to http://www.zotero.org/ , click on ‘download.’ When you have to reboot your browser, do so. You will now have zotero running at the bottom. When you go to a website about a book (either through York library or Amazon.ca), you will now see a little book icon in your web browser address line. Click it, and you’ve added a book to your Zotero database. This is a good way to collect a list of books, journal articles, etc. You can actually add notes about them, and begin building a comprehensive research database. If you are confused, please watch this video. Note in the screen above, that you can type in the page number! You may need to rejig the first citation of any book slightly, but subsequent ones will show up in either proper short form or as ibid if they directly follow the previous one. 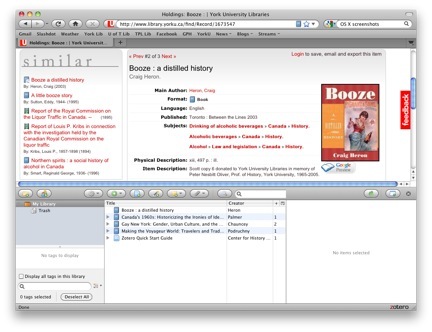 It will also automatically generate a bibliography. 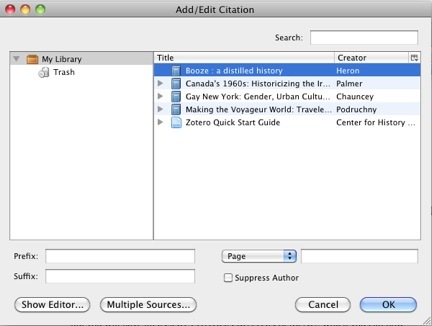 This is useful as you can use Zotero as your central notekeeping database. It also saves to the ‘CLOUD,’ or the internet. This means that you can use Zotero on multiple computers and your data should remain the same if you are logged in.